Example projects are provided with Mobile Data Studio (MDS) to open and explore alongside the Mobile Data Studio Skills tutorial for detail. Example projects are typically installed into C:\Program Files (x86)\Mobile Data Studio\Examples. An example for efficient entry of data and interview in the field; eliminates paperwork to enable direct feed into database. DROP LIST POINT: The Drop List is a common point and in MDS; it has six styles, including for both single and multiple selections. In this example, 'Single selection, edit and save' is used for entries to be added and edited in the field. New additions in the field are unique to the mobile device they are entered on. DATE/TIME POINT: The MDS system records the date and time a data session is created and last saved, in addition the Date/Time point presents 13 options for display and format. SELECTION POINT: The Selection point presents data options in a highly visible and convenient format, for both single and multiple selection, and use of underlying code based data recording. In MDS Design mode, a Selection point can be readily converted to a Drop List and vice versa. BOOLEAN POINT: The Boolean point has a simple tick, cross or zero format on the page; however, in Design mode these can be set to any value, including to record phrases of text. LINK POINT: The Link point enables customised navigation in a project; either in combination with or rather than using 'Next' and 'Previous' buttons. The font size in Link points can be increased for Tablets, and images links can be used instead of text. The Link point can also be activated to 'jump' to another page by a Logic point responding to data input from another point. GPS POINT: See 'Track Assets' project below. An example for deployment and return of a service job via the mobile phone network; with record of parts used ready for accounts and invoicing. The 'Field Service Report' project is provided with Mobile Data for iPad and iPhone at the App Store. A similar 'Service Report' project pitched to Windows Mobile supports the Outlook point and Print point. VISUAL STYLE: Project Properties for Visual Style enable customisation of the appearance of a project. Modify the MDS default blue and white with business logo and colours. EDIT POINT: The Edit point is a 'box' of many sizes for entry of text and numbers; it can also accept bar code and RFID data. It has controls for default and read only on the mobile client. 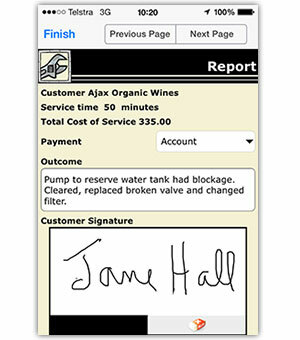 SKETCH POINT: Signature for customer verification of service can be taken in the versatile Sketch point which can also be used for capture of Camera point image to sketch on the image, and for taking some quick notes on a Tablet. PRINT POINT: The Print point enables attachment of a HTML Template in Android, Apple iOS and Windows Mobile to which data from a session can be output for print of a HTML file with third party software. The HTML file can also be attached to emails on iPhone and iPad. MOBILE PHONE CONNECTIVITY: This project is typical of many projects which are supported in the field by the powerful and secure wireless TCP/IP functions of MDS. These functions are ready to go 'out of the box' in MDS and are easily configured to support many mobile device users in the field. Confidentiality of wireless communication is protected by high level 256-bit AES encryption and communications are tracked by a visual Activity Monitor and text Log. A community service project which enables a standardised assessment of bushfire hazard and risk management for homes. The information is processed to a KML file and can be displayed by tap on a home in Google Earth. Please see detailed information at the Bushfire Ready Map page. GPS POINT: The format used in the GPS point must be decimal Latitude (%lat%) and Longitude (%long%) for use in Google Earth. 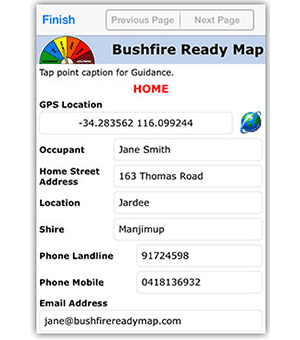 GUIDANCE: When the Bushfire Ready Map project is open a simple tap to a data point caption will show 'Guidance' for the point. Following Guidance is essential for consistency of assessments. 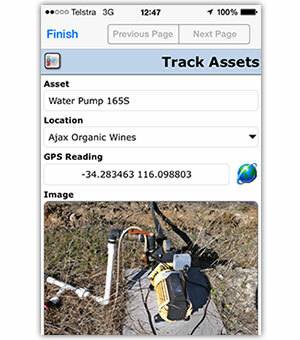 An example project for identifying assets and their location; the session data can be returned to the field for periodic status reports on the assets. GPS POINT: The GPS point enables GPS data to be captured alongside other data and images. Twenty GPS outputs in accordance with NMEA standards, including Easting, Northing and Zone based on WGS-84 global standard. Decimal Latitude and Longitude should be used for display on Google Maps and Earth. 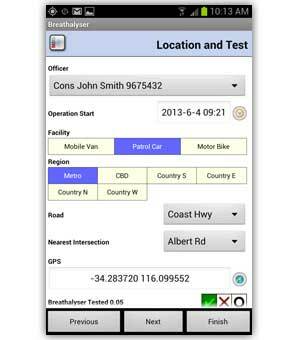 GPS Setup enables configuration of Port and Baud Rate for wide range of mobile devices, including Smartphones, Tablets and 'ruggedised' devices. Many projects can be developed for mining, agriculture, environment, transport, military, education and recreational uses. DATABASE INTEGRATION: The powerful Data Pathway of MDS enables both basic (Excel and HTML) and advanced (XML, ADO database, scripting) data processing. XML Incoming is a convenient method for dispatch of sessions to the field; if a Smartphone is not connected, sessions will be queued until login. Asset related data and images can be exported to KML and KMZ files and viewed in Google Earth and other mapping media. 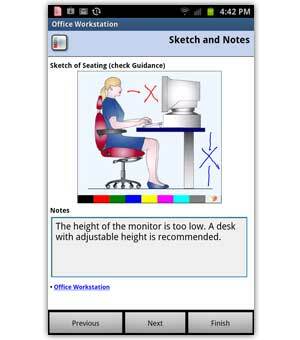 An example project for assessment of the ergonomics of a typical office workstation, using simple Safe, Unsafe, Not-applicable score, supported by Guidance notes. This is an example of the type of 'checklist' that can readily be moved from paper on clipboard to Smartphone or Tablet. SKETCH POINT: The versatile Sketch point can present illustrations for mark up on the mobile device and these images are accurately rendered back to the office. GUIDANCE: Guidance notes can be entered in points and pages during project Design to assist use of a project. Guidance is used in the Office Workstation project to achieve consistency of assessment, either associated with point or page. Tap point caption or top of page to see notes, and tap page to return. CONTENTS PAGE: In Design mode an edit control can automatically generate a Contents page of Link points to the pages in a project. An example of a typical field sampling project with GIS data capture alongside samples. 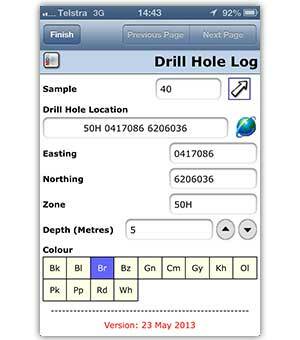 The Drill Hole Log uses the Incrementor point to keep track of samples. GPS POINT: The twenty GPS output options in Design can each be selected as 'tokens' and made into a 'parent' GPS string of values, and also be individually output to 'child' points as shown in this example with UTM values for Easting, Northing and Zone. INCREMENTOR POINT: Enables point values to be incremented with opening of a new session. This function is useful where numbers for orders, invoices, samples, tracking etc need to be generated in the field on the mobile device. 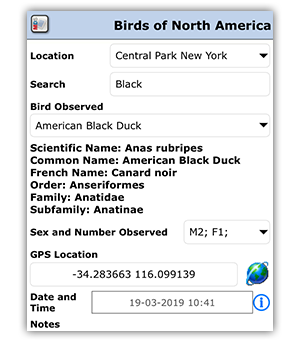 An example of a field observation project, recording observed bird species, location, and image taken. ULTRADROP POINT: The 'Bird Observed' UnltraDrop point holds data for 2078 bird species. In this example the source data was from an Excel spreadsheet which was saved as tab delimited text and imported to the UltraDrop. The UltraDrop is much more powerful than a standard Drop List point. The UltraDrop can be dynamically updated via the wireless network. LAYOUT POINT: Presents data output from data points in a formatted manner. 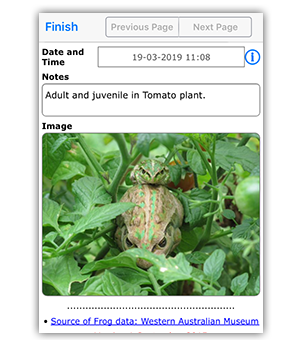 An example of a field observation project, recording observed frog species, location, and image. ULTRADROP POINT: The 'Frog' UltraDrop point manages 87 species data. In this example the source data was from an Excel spreadsheet which was saved as tab delimited text and imported to the UltraDrop. CAMERA POINT: The Camera point can either capture an image from the inbuilt camera or choose from gallery/library. 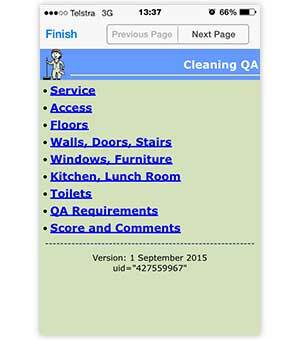 An example of a Quality Assurance assessment project scoring against relevant criteria for commercial Cleaning. The project can be easily modified for specific types of properties. MATH POINT: The application of scoring formula in the Math point takes into account that not all criteria may be applicable in all assessments. SELECTION POINT: Presents a convenient mode to input scores, for either small or large fingers of busy supervisors. LINK POINT: Enables clear and non-linear navigation to relevant assessment criteria on project pages. An example for field sales and return of order via the mobile phone network; ready for invoicing and efficient supply chain. ULTRADROP POINT: The UltraDrop can manage thousands of data items, products, codes, descriptions and prices. The items can be updated using Dynamic Data automatic updates via the mobile phone network from source files in the office. Data in the UltraDrop point can be filtered (searched) by input from Edit Points (including bar code) and Drop List. LAYOUT POINT: The Layout point enables text and images to be presented anywhere on a project page. 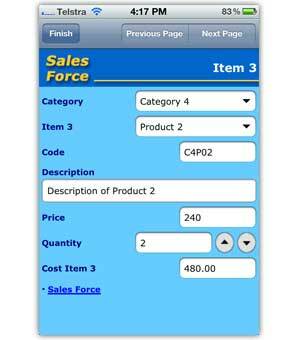 In Sales Force the Layout point is used to summarise sales items on the Order page. SECURITY: The powerful Data Pathway of MDS enables both basic and advanced data processing. XML Incoming is a convenient method for dispatch of sessions to the field; if a Smartphone is not connected, sessions will be queued until login. Confidentiality of wireless communication is protected by high level 256-bit AES encryption. 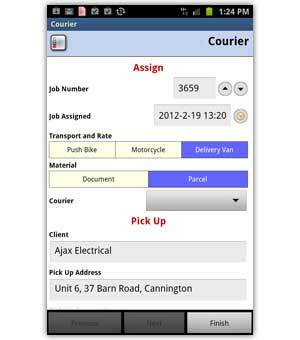 An example project for delivery businesses managed via the mobile phone network. LOGIC POINT: The presentation of the Transport and Rate and Material points is controlled by a Logic point, once a courier is selected they are hidden to show client details higher on the page for visibility. Logic points can control display of points in a project, and output data, based on conditional logic criteria. Logic points can be set up in Design to perform either or both of the display and data output functions. This is simple small example of Logic point function, it can control complex logic operations. SESSION LIST COLUMNS: The Session window in Mobile Data on a mobile device can present key information identifying sessions; for example 'Job Number' and 'Pick Up Address'.